« LG's Netflix streaming Blu-ray player announced. What, no Wi-Fi? 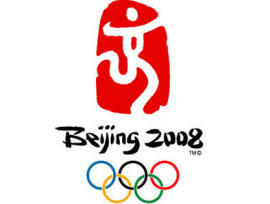 The 2008 Olympics are due to start in Beijing in seven days, five hours, and change, but the reporting and blogging surrounding the most digital of all Olympics is well underway. Read on to learn more about youth and the digital Olympics and the possibility the Internet will break when billions of people worldwide access the Web to stream video and static content. 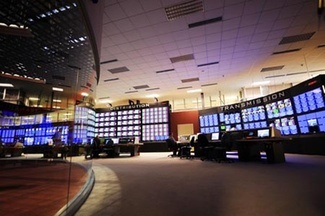 In just the past few days there have been announcements regarding schedules, video players, compatibility issues, even behind-the-scene looks at what it will take to produce 2,000 hours of live content for television consumption and 5,000 hours of streaming content for the Web. If you start now, you just might finish in time for the start of the games on 08-08-08. Reuters detailed the impact of the digital revolution on the 2008 Olympics, drawing the conclusion that streaming events and highlights over the Internet will attract younger viewers, who are not expected to watch the events live. The average age of people watching the 2004 Games in Athens was more than 40 years old, a statistic that’s not expected to change for the Beijing Games. Anytime there is a big event happening somewhere in the world, the Internet is expected to crash. A survey from Blue Coat Systems, an appliances and software company that helps organizations secure Web communications across a distributed enterprise, says that 95 percent of the CIOs sampled are worried their networks may fail when the Olympics start, even if it’s only two people watching the games at the same time in the office [via Silicon Alley Insider]. Sounds a bit Chicken Little-ish to us. We think the Internet’s infrastructure has improved enough to support more than two simultaneous users. If not, the whole idea of IPTV, digital entertainment content delivery, and cloud computing is in real trouble. NBC let us know how long the delay will be between events appearing on television and then online. Popular events like swimming, gymnastics, and track and field will be broadcast live in prime time on the East Coast, then delayed online until after they’ve been seen on TV in the Pacific time zone [via NewTeeVee]. By the way, the Olympics are expected to be the highlight of the year for sports online after the success of the March Madness NCAA men’s basketball tournament, the U.S. Open playoff, Major League Baseball’s streaming efforts, and the recently-completed Wimbledon tennis tournament. Many news sites and pundits have been saying for weeks that to watch streaming video from NBCOlympics.com viewers would have to download and install Microsoft’s Silverlight player, Redmond’s much ballyhooed competitor to Adobe’s Flash player. That’s not the case says BusinessofVideo.com. Viewers who choose not to install Silverlight still will be able to get stand-alone video streams if they have Windows Media player. This is good news for folks at work who don’t have admin rights to their desktop machines and can’t upgrade to the Silverlight player. Using Silverlight, however, will give viewers the optimal streaming experience as they will have enhanced video options and can switch between multiple live streams, among other perks. If you care to watch Olympic downloads through the Windows Vista Media Center, NBC is enabling its Olympics on the Go service to allow it to happen. NBC will provide downloads from sports such as beach volleyball, swimming, and gymnastics. Video quality is near-HD. 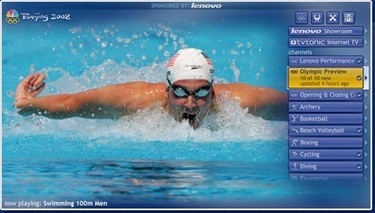 TechCrunchIT points out that Olympics on the Go is sponsored by PC-maker Lenovo and powered by TVTonic. When you try to install Microsoft’s Silverlight on a Mac you get a compatibility error notice. Users who dual boot an Intel-based Mac with Parallels or Boot Camp can work around this issue; everybody else is SOL. TechCrunch also details NBC’s launch of on-demand Olympic coverage in high definition. If you’re wondering what it takes to bring the Olympics to your PC, check out Ina Fried’s detailed post on News.com. It’s a Herculean effort. Or should that be Zeus-ian? And what would the Olympics be without the tens of thousands of products and souvenirs to buy, many of which are made right there in China? 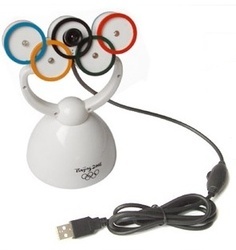 This week we saw the introduction of an Olympic-themed Webcam that’s shaped like the five-ring Olympic symbol. It features a cheap 1.3 megapixel camera in the center ring with a USB 1.1 connection. Each ring has a glowing LED to up the cheese factor [via Gizmodo]. The outrageous bling award goes to an Olympics-themed iPhone that is studded along the edges with 88 diamonds. It will sell for $8,224. No word if it’s the iPhone 3G [via Ubergizmo]. Netflix streaming to Mac courtesy of Microsoft! Could Nokia phones be next?